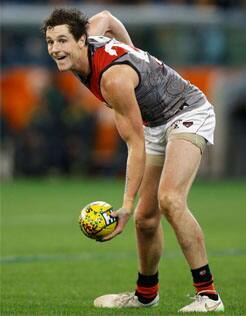 Jake has requested a trade to St.Kilda with Essendon hopeful to secure a pick number five for the talented defender. “We think that Jake is worthy of their first pick. “We’ve had a couple of discussions with St Kilda, we think that we’re being fair and reasonable. We’re not interested in third party, fourth party deals. We think he’s worth that, it’s clean, it’s straight, and it can get done early. “I respect the Saints, Ameet (Bains) is terrific to deal with. The 24-year-old announced his intention to move away from the Bombers in late September, looking to restart his career with Melbourne. The deal will reportedly see Melksham join the Demons on a four year deal. “He’s made it clear to us that he would like to go to Melbourne. We’ve had a number of chats with Todd Viney (Melbourne List Manager) and I think it’ll be pretty straight forward next week,” Dodoro said. “I don’t want to put a number or a draft pick on it at the moment because there is a little bit to play out, but I would think that one will get done pretty quickly next week. Despite reports, the Brisbane Lions Matthew Leuenberger has not officially joined the Bombers. The 27-year-old free agent is set to decide between either the Bombers or Sydney early in the week. “We’re pretty keen to get him to Essendon, but by the same token we understand there is a couple of clubs that might be looking at him. “We’ve spoke to Paul Connors (Leuenberger’s Manager), they’ve got a few things they want to weigh up. The veteran midfielder is likely to remain at the Bombers in 2016. Stanton and the Club are close to agreeing on a deal, with the final few details being worked out. Stanton has played 248-games for the Bombers and enjoyed one of his best seasons to date in 2015. “We’re in constant dialogue with Adam Ramanauskas (his manager). It’s contractual, it’s not that he doesn’t want to be at Essendon and we certainly want to keep him.